Just too Hot to Work in! Temperatures have really soared these past few weeks and I have often found it just too hot to work in! About two weeks ago we had a heatwave which lasted 4 days and left everyone feeling drained and lethargic. Temperatures were in the 40’s and it was too hot to do anything! Luckily I only had one selling day during the heatwave period. Working on my seashell mosaic artworks, under the shade of my parasol and with the breeze coming off the sea, I am usually quite comfortable. But where was the sea breeze when you really needed it? It made me realise how much I rely on it to keep me cool during the long days that I am selling my seashell mosaic art at the edge of the beach in Almyrida. 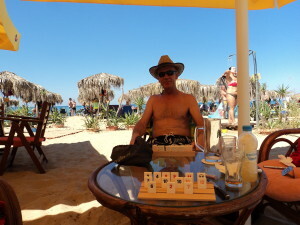 On gorgeous Georgioupoli Beach, playing Rummikub with Nick! On the first day of the heatwave I had my air conditioning units serviced and cleaned. Then after my selling day on Friday I spent the Saturday indoors with the air conditioning on non-stop! On Sunday, the last and hottest day, my mate Nick and I spent the day at Georgioupoli beach. There was actually a breeze and the sea was the warmest and calmest I’ve ever known it be there. I could have drifted in that sea all day long, feeling the intermittent waves of cold river water mingling with the warm sea water. It really was heavenly! With every dip we took we saw people just standing in the sea, chatting! We had Lunch on the beach and played a couple of games of Rummikub in between frequent stops for a swim or cold shower – all within easy reach… although Nick almost burnt his feet on the sand! Talk about walking on hot coals! This wonderful day on Georgioupoli beach saved me a fortune on my electric bill and was the absolute obvious and best thing to do to escape the heat – Spend time in the sea! With world economic circumstances prevailing I am lucky to be still selling my seashell mosaic artworks, albeit a lesser number of them. My larger and more expensive designs have been selling, as well as many of my new designs. But it is my small 5 x 7” designs that are suffering. 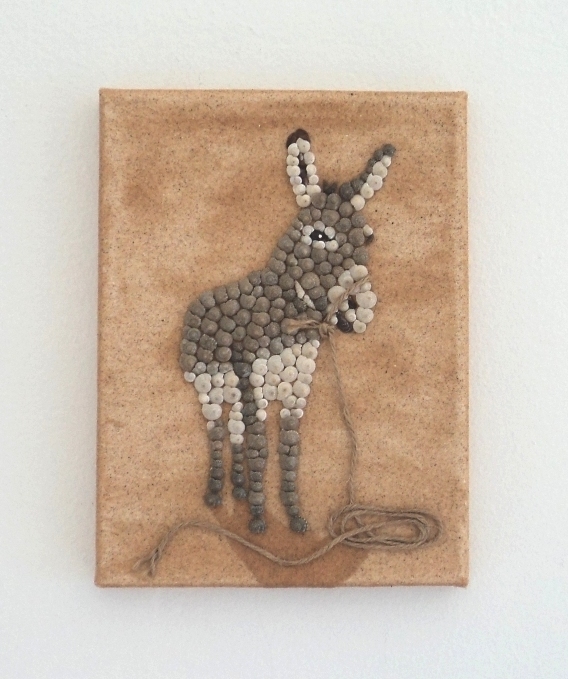 They are the cheapest artworks I sell and they’ve been super popular with all the tourists who have visited Almyrida during the last 7 years. Now everyone is having to tighten their belts and all the local services and businesses have noticed reduced spending. This recession began during the middle of last summer and I can’t help wondering if Brexit has much to do with it! Anyway, I am most excited about my sister and brother-in-law’s visit! Karen and Mike are arriving on Saturday, for a much needed week’s holiday. I am really looking forward to spending some quality time with them and having a little break myself – but only on non selling days! Back to the present and with temperatures in the mid 30’s it’s been hot, hot, hot again but rain is forecast for tomorrow and that is most unfortunate as it’s a selling day! But I am going to turn up regardless and pray the rain is contained in the mountains, over which already there is heavy cloud cover. At least if it does rain, everywhere gets refreshed again and temperatures drop to a more manageable level. 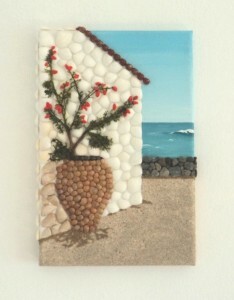 This entry was posted in Blog Posts and tagged Almyrida, Seashell Mosaic Collage by micmaryjo. Bookmark the permalink.